The Native Art Mural This and all of the murals on this site are within the traditional territory of the Coast Salish People. This work contains a number of Coast Salish and other First Nation designs including the Orca – more commonly known as the Killer Whale, Bear, a mythical man/spirit and a stylized sun. Vancouver is known as the ‘Urban Rez.’ Most people are unaware that in British Columbia 74% of Aboriginal people live off-reserve and 80% of those live in large urban centres like Vancouver. 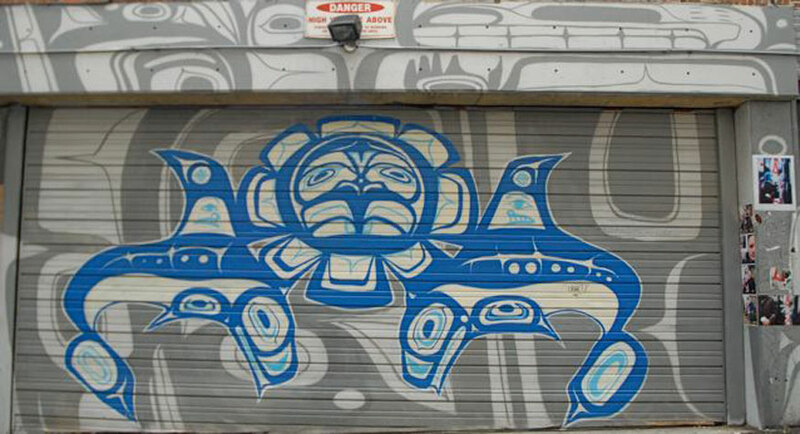 Vancouver’s Eastside has a vibrant and artistic Aboriginal community which you will see through many other forms of private and public art spread throughout the city.